It’s again that time of the year: The American College of Sports Medicine published their worldwide survey among 19,000 fitness professionals, asking them what 2012 fitness trends they expect. Pilates is finally completely out, Zumba makes its first appearance on the list. Looking at the survey, you’ll first notice that Pilates is finally gone from the top 10. Rightfully so, I might add. When I wrote about this survey in the last year, I already said Pilates for me is among the most useless fitness activities out there – any woman looking at Pilates should rather consider real strength training and real yoga. 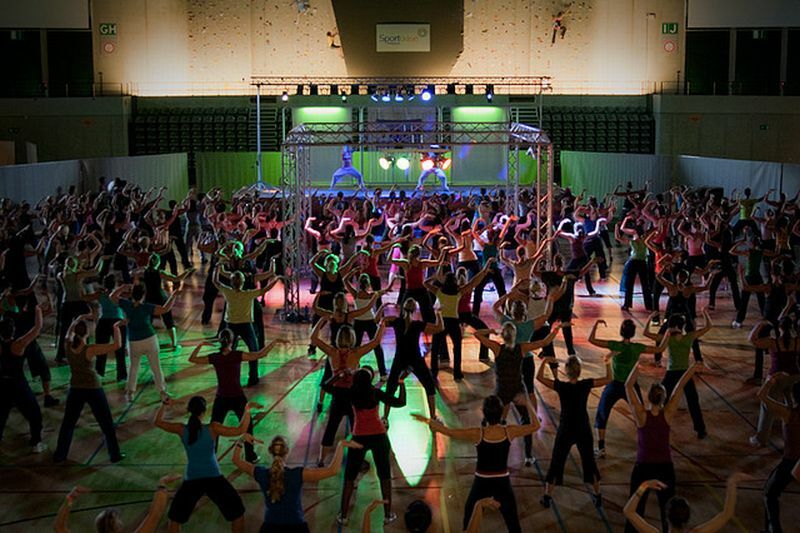 Zumba, a mixture of aerobics and dance, is a newcomer and makes its first appearance at the ninth spot. It is classified under “functional fitness” and, to be honest, I have an aversion against Zumba, that is mainly fueled by commercials that make it look like a fitness program superior to all others (“ditch the workout, join the party”). That it engages people in physical activity is nice enough, but in my opinion it is far from being as sensational as those advertisements make it out to be – put on some music, dance along with it and you pretty much have the same effect. On the other hand, there is in my opinion a welcome newcomer at no less than No. 2: strength training for older adults. I think this is a positive development, as working out for too long was considered an activity for younger generations – I even have people in the below 40 group ask me if they are too old to work out. In reality, a whole sleigh of research has already shown that older generations can very much benefit from resistance training. Seniors that work out have stronger bones, better balance and fewer back problems. That directly takes us over to what again is the list’s top spot: the quest for “educated and experienced fitness professionals” . It goes without saying that coaches and trainers should know what they are doing, although that often enough is still not the case. But it actually goes beyond that. Jenn of Personal Fit Coach the other day wrote an article about how difficult many gym instructors find it to relate to why people decide to join a gym. Among these reasons can be low self-esteem, weight problems and depression – a little psychological schooling could go a long way here. It will be very interesting to see how fitness coaches will cope with elderly visitors, who have their very own special needs. What are your trends? Any goals you already set yourself for 2012? Pictures courtesy of “lincolnearthday” and Simon Schoeters. Thanks so much for the mention. I really appreciate it.